America's First Christmas Store in Smethport is beginning a huge, invitation-only sale on Black Friday - the biggest shopping day of the year - by starting a "going out of business" sale on their 70th year in business. A fixture on U.S. Route 6 since 1935, the store is a "destination business" for the region, explained Smethport Borough Mayor-Elect Ross Porter. Owners Greg and Dee Buchanan sent out fliers to "local customers and friends" inviting them to participate in the sale. The notice says, "We are closing our doors forever. Contacted by The Era Tuesday, Dee Buchanan said, "Greg and I are quitting the business. I have loved every minute of that time, but it's time to spend more time with family. If we can't sell the business, the store will close." There are several apartments above the store which is located at West Main and Mechanic streets. "Ideally, we can sell the building and the business," Buchanan said. Porter said that's the future he hopes to see for the region. "The store has been part of our history," he said. "Our history is not going away. I, for one, believe that some form of the Christmas Store is going to exist. "I'm really hopeful we're going to be able to reinvent the Christmas Store and its traditions and tie it in with Smethport's future," he added. "Take this long tradition and tie it in with a broader base and recreate it. "It started way back. It's part of our fabric. I think there's going to be a renaissance for this," Porter said. A historian as well as mayor-elect, Porter said, "I think that you build on the future by knowing your past. That history is Smethport's. "What's being sold are Christmas ornaments and displays. The actual concept, that's the town's," he said emphatically. The business was created by Leonard Johnson in 1932. By 1935, the Christmas displays he made were nationally known and the store became a tourist attraction. "Part of its nostalgia is when people drive into Smethport and feel and hills sit around them," Porter added. "We're going to work at keeping that part of our community." And people from all over the world have driven into Smethport to visit the store, making it one of the area's top features on the Allegheny National Forest Vacation Bureau's Web site and tourist promotion packages. "The Christmas Store has just been an icon for our area for over 70 years," said Linda Devlin, executive director of the ANFVB. "We're very hopeful that someone will pick up the gauntlet where Dee Buchanan left off and possibly carry it forward." Devlin noted that the Christmas Inn and Christmas Store in Smethport have been unique destinations that draw tourists to the region. "They've had visitors from around the world over the years," she said. In the seven years that Devlin has been with the Vacation Bureau, she has seen travel writers from around the globe feature the Christmas Store in magazines or on shows. "There was Jane Wilson from the U.K. and a radio talk show host from Ireland," she said. "They're known far and wide." State Rep. Martin Causer, R-Turtlepoint, echoed Devlin's sentiments about the store's importance for area tourism. "Several times I've come through Smethport and seen tour buses out front - whether they've been just passing through or traveling on Route 6," he said. "It's a very important tourist stop. "It's a huge blow to tourism," he said of the store's closure, "very obviously." 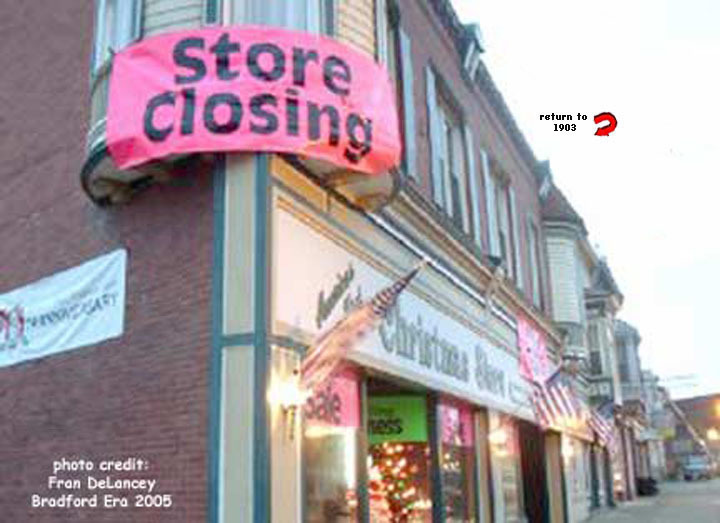 The store's impending closure will have another detrimental impact on the area's travel industry, Devlin added, as the area has yet to recover from the 2003 tornado that destroyed more than half of the Kinzua Viaduct. "We definitely have some challenges ahead of us," she said. "Since the tornado at the viaduct, it has impacted other businesses throughout the region." Devlin explained that motor coach tours would travel to the region to make the trip across the viaduct on the Knox & Kane Railroad, which no longer operates, and to see the bridge, which remains much the same as the tornado left it. Once people came to the region, they would visit other area attractions, such as the Christmas Store, she explained. "This is an added incentive to look for revitalization at the (Kinzua Bridge) State Park," Devlin said, adding that we need to draw people back to the area. While expressing that she had not spoken to Buchanan as of Tuesday evening, Devlin said, "We're just hoping somebody will come in and pick up the vacuum that's left behind with their closing."